Combine pecans, graham cracker crumbs, sugar, and melted butter. Press into bottom of 9- inch springform pan. Bake at 325 degrees F. for 10 minutes. Let cool. Combine cream cheese and sugar; mix at medium speed until blended. Add cinnamon, nutmeg, allspice, and pumpkin. Mix until blended. Chill cream cheese mixture until slightly thickened, approximately 20 minutes. Fold in whipped cream; pour over crust. Chill until firm. 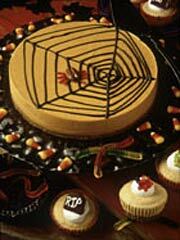 For a creepy decoration, draw a spider web using cake decorating gel and top with a plastic spider or two.